And by the way, happy #TasterTuesdays! Guests of American Cut have the option to add white truffles to any dish for a $50 supplemental charge. Flambé It: You can opt for the Tableside Flambé (bone marrow butter with truffle, flambéed with brandy) if you are looking for an exciting, tableside preparation. The team recommends this option for any of the restaurant's steak selections, including the signature Tomahawk Ribeye Chop. Shave It: You can also add 3 grams of shaved white truffle to any dish – I recommend shaving truffles on options such as the Dad's Planked Salmon, or Potato Puree "Robuchon." Il Tartufo, a Truffle Pop-Up located in Eataly, has made its way to New York City. You heard me correctly; an Il Tartufo has collaborated with Urbani Truffles to dedicate an entire restaurant to dishes served with truffles. The restaurant is open for weekday lunch from noon to 3 p.m. from Nov. 2 to Dec. 31. This week I indulged in a six course tasting menu curated by Eataly New York chef Fitz Tallon. I tried some unlikely combinations that I was happily surprised about. For example, Pane, Burro E Acciughe which is a homemade bread with white truffle butter, cured anchovies and fennel salad AND Carne Cruda e Topinambur, better known as steak tartare with sunchoke puree and shaved sunchokes. The middle courses consisted of Gnocchi alla Romana and Fazzoletti. Now let me explain, the Gnocchi alla Romana is a baked semolina and parmigiano dumpling with a poached egg and truffles. The Fazzoletti was coated with a chicken ragu, porcini mushrooms, parmigiano reggiano and truffles. By this point in the meal I had already reached my limit – come on even #onemoredish gets full! But we were told that there were two more courses coming out and I could not resist. To end the meal, we had the Brasato Di Manzo – Nebbiolo braised Flatiron Steak with celery root – and for dessert Zabajone e Crumble di Nocciole. The steak tasted more like short rib to me, as it was tender and fell apart as my fork touched the meat. Il Tarfufo is probably one of the only places in NYC where you can get truffle on dessert – now that's what I call #baller. So you may know that at MAMO, truffles are not scarce. Basically anytime of the year you can get luxurious truffle dishes such as the Truffle Raviolini, which is to die for! For truffle season, MAMO has created a cocktail just for the season – The Martini di Tartufo which expands upon the restaurant's love for the prized 'shroom. The $50 libation features Black Moth truffle vodka, dry vermouth, Campari and shaved truffle. 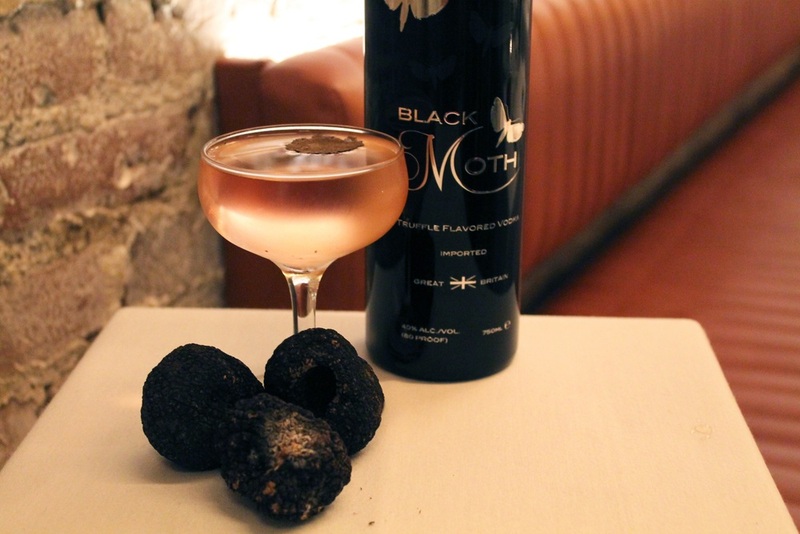 Black Moth is infused with Périgord truffles, the finest black truffle available, and MAMO is currently the exclusive holder of Black Moth in New York City. Basically, get over to MAMO as fast as you can because who doesn't want to Instagram their truffle x vodka cocktail?! At this point Babbo is a West Village staple, as Mario Batali has been around the block a few times. Babbo is offering a special white truffle group tasting menu for $99 per person. My favorite? A tie between the Duck Egg Sunny Side Up and the Grilled Hanger Steak. TRUFFLEPALOOZA: A Celebration of White Truffles from Alba is what Locanda Verde is calling it. From October 20th to December 20th, diners have a choice of 4 truffle dishes that are on the menu - Arancini fontina val d’aosta & garlic aioli; Tagliolini Piemontese poultry jus & castelmagno; Uovo Ravioli egg yolk, ricotta & balsamic vinaigrette; Polenta al Forno spiced pork sausage & caciocavallo – and daily specials. Last but not least, Marea. Standing out among the other restaurants offering truffle, Marea is primarily an Italian seafood restaurant. Marea is offering white truffles on a butter tagliatelle or risotto for $115. This simple approach truly let’s the truffle flavor shine.